…like Garlic Scape Pesto breath before 8am. 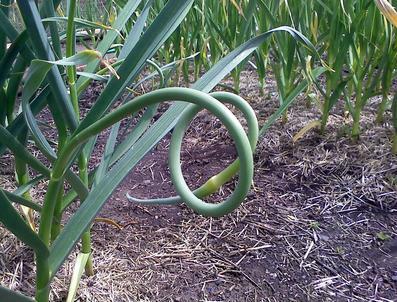 Yes, folks: For the next few weeks, we have deliciously decadent garlic scapes available. 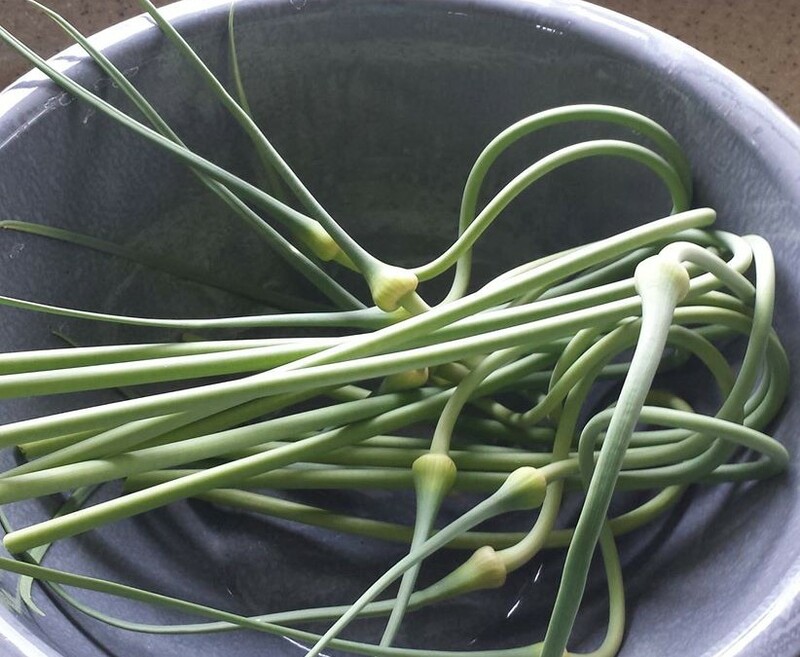 Simply put, the garlic scape is the flower bud of the plant. As the scape emerges on a mature garlic plant, the stalk curls – some varieties with just a slight bend, and others with two or more twists. As it begins to straighten out, we cut off the scape and the plant’s internal mechanisms tell it to turn its energy to bulb growth. Bulbs increase in size by up to 20% before harvest a week or two later. We use them just like you would garlic or scallions, and from the scape you get full garlic flavor. 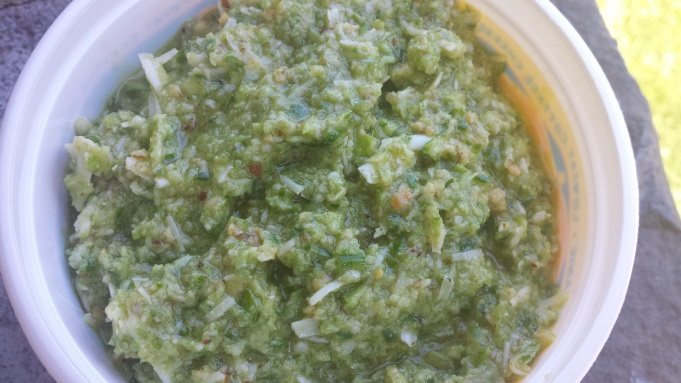 Our favorite recipe to take advantage of the very brief garlic scapes season is Garlic Scape Pesto. Use it as a dip, or an ingredient in any recipe that calls for pesto — pasta, as a condiment, on grilled meats and seafood, for appetizers of all sorts. The world is your garlicky oyster with this tasty delight. What else is available for picking? 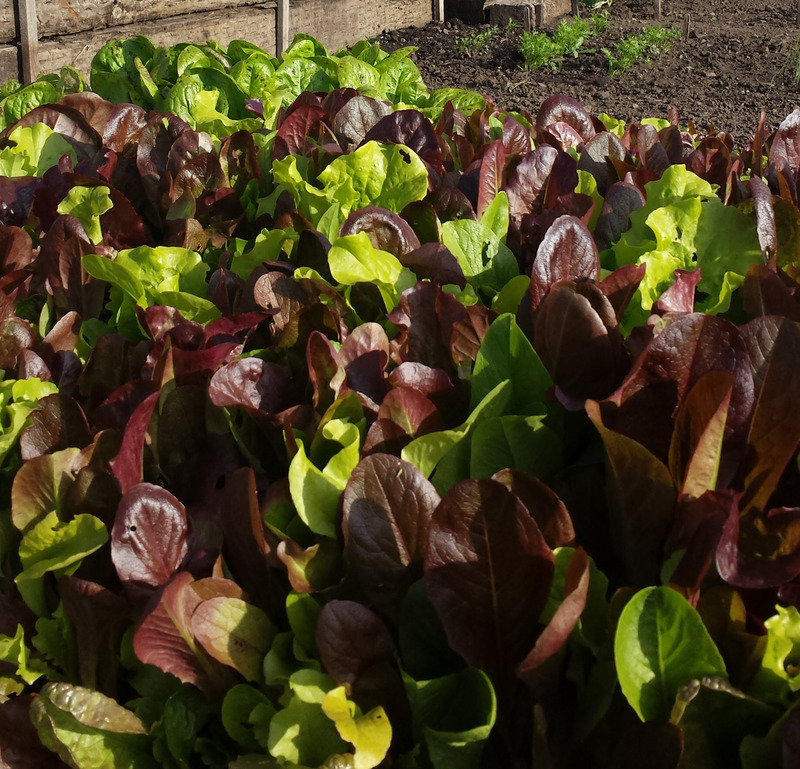 We thank you for small donations to the farm fund, and every penny contributed goes right back into the farm, seed swaps, seed stash, and agri-education efforts. Please stop by the little Amigo near the arbor.